Orange peels in white vinegar – the perfect citrus cleaner cleaning solution! In our effort to become more self-sufficient, we have given up using traditional household cleaners and have converted to a greener method for cleaning. We have all heard of throwing orange peels down your garbage disposal to clean out the drain and to make it smell better. We have also heard of vinegar being used as an all purpose cleaner for your home, but many people avoid it because of the odor that it leaves. But have you considered combining those two concepts to use those orange peels in your home made cleaner? The orange scented citrus cleaner vinegar is safe, effective, and non-toxic to use on windows and as an all purpose cleaner in the kitchen and bathroom. Not to mention, a whole lot cheaper and healthier than buying chemical cleaners. And if you don’t have time to clean – just spray a few squirts into the sink, and your house will smell like it is clean anyway! 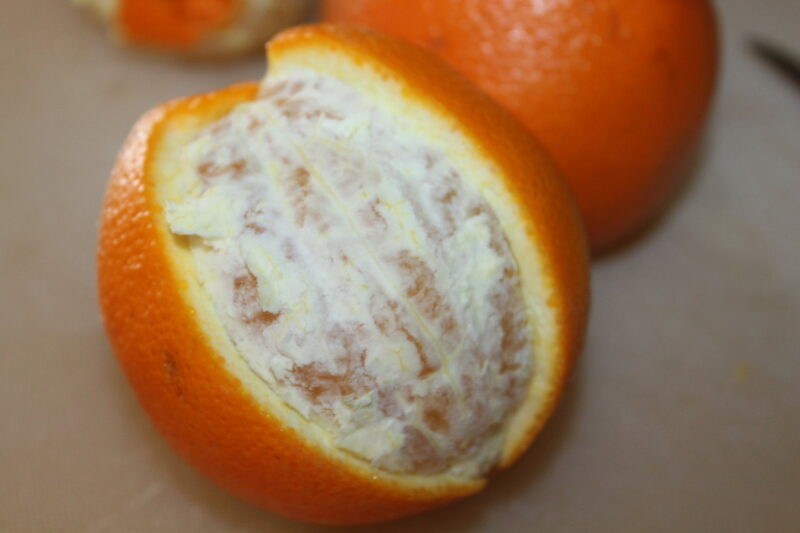 Use the peel of 2-3 oranges to make your cleaner. 1. Peel several oranges and place as flat as you can in a pint mason jar. 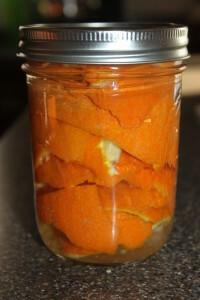 **You can also save your orange peels in the freezer until you are ready to fill a pint jar. Pour the vinegar over the orange peels until it reaches the rim. 2. 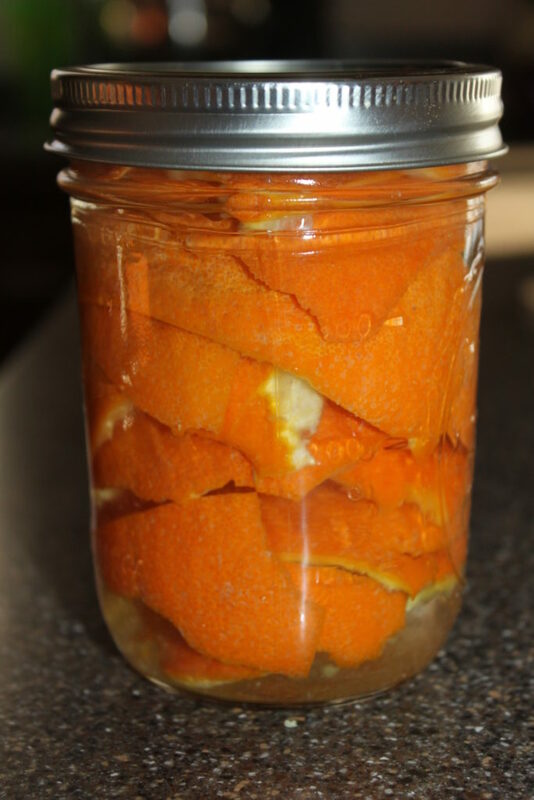 Place white vinegar over the orange peels and fill to within 1/4 inch of the top of the mason jar. 3. Seal with a lid (lid and ring) and let sit for 2 weeks. 4. After two weeks, strain liquid. Measure how much orange vinegar you have. Pour into a clean spray bottle. Place liquid in a spray bottle and add twice the amount of water. Shake well and use! 5. 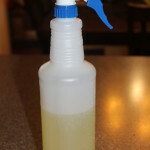 Pour double the amount of water into the spray bottle (2:1 ratio water to vinegar solution). Shake well. It has really become a great daily all purpose cleaner for my sinks and counter tops! Peel several oranges and place as flat as you can in a pint mason jar. **You can also save your orange peels in the freezer until you are ready to fill a pint jar. 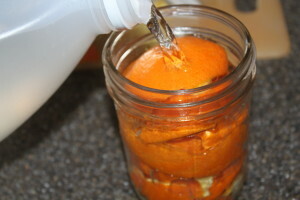 Place white vinegar over the orange peels and fill to within 1/4 inch of the top of the mason jar. Seal with a lid (lid and ring) and let sit for 2 weeks. After two weeks, strain liquid. Measure how much orange vinegar you have. Pour into a clean spray bottle. 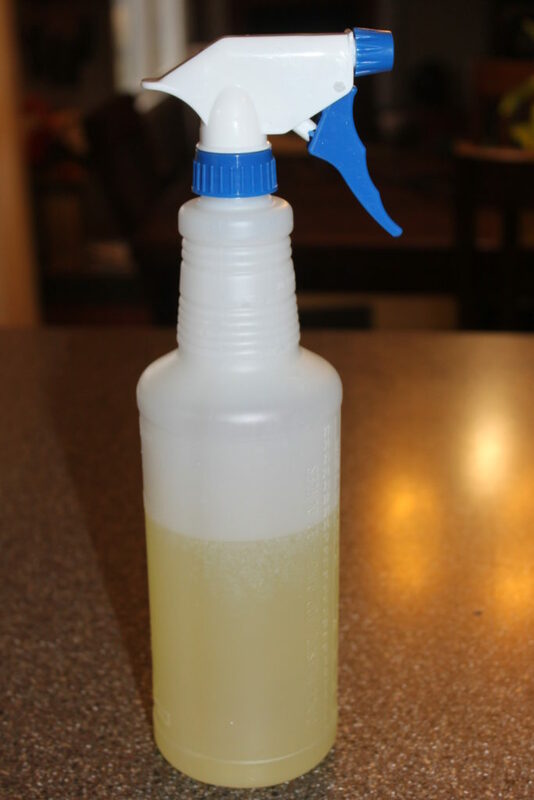 Pour double the amount of water into the spray bottle (2:1 ratio water to vinegar solution). Shake well. Be sure to check a small surface area before using. oldworldgardenfarms March 21, 2014 September 2, 2018 Cooking, Recipes, Sauces Dressing Jams Misc.